This cage made from vinyl-coated ½" square hardware cloth and a 2' X 3' plastic cement mixing tray, both purchased at Home Depot. A friend and I made this cage in about 3 ½ hours. It is light-weight, attractive, very easy to clean and the materials only cost about $35! 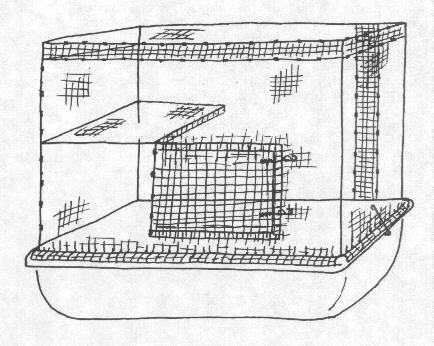 The main advantage of this cage is that the wire sides of the cage do not sit in the bottom of the tray, but sit up on the edges of the tray. This keeps the wire sides cleaner. 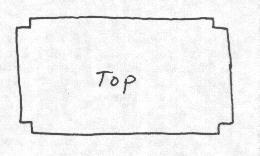 The disadvantage is that because the ends of the tray slope, the bottom isn’t as big as the top. The hardware cloth comes in either white or green, and I recommend the green as it is easier to see through. It comes in rolls 5' long and either 2' or 3' feet high. We made our cage using the 2' rolls, and the total height of the cage is 30". Because the mesh is flexible I found it much easier to work with than plain hardware cloth. However, this means the door isn’t very stiff and needs 2-3 fasteners (depending on the skill of the occupants!) 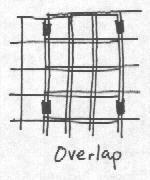 An option would be to make the door out of stiffer wire mesh, such as galvanized hardware cloth. While this cage isn’t as strong as those made out of heavy mesh (you wouldn’t want to sit on it! ), I find it works well and seems strong enough. The tray is very strong and strengthens the whole cage. I have been using it for a while now and I have found that my rats have chewed off some of the vinyl coating, but most of it is still left. Step 1: For the walls you will use one full roll and one partial roll. Unroll 2 rolls and lay them flat. Cut one of the rolls to a length of 47 ½". A felt pen is helpful for marking where to cut. When doing the cutting, cut flush to the edge of the piece, leaving the “tails” of wire on the left over small piece. This small piece can be used a shelf if you like. Step 2: Lay out the full roll so the horizontal wires of the mesh are on top. 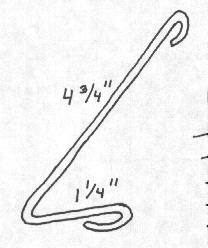 Measure over 32 ½" from the left end and cut a notch in the bottom of the wire 2" up and 1" across as shown. The 32 ½" should measure to the center of the notch. Bend the “tails” of the wire over as shown. From the center of this notch, measure over another 20 ½" and cut another notch. Next, lay out the piece you cut in Step 1 so the horizontal wires of the mesh are on top. Measure over 20 ½" from the right end and cut another notch. Step 4. 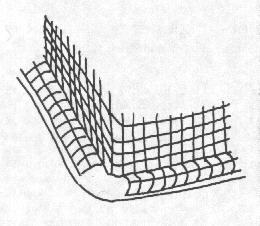 Bend the bottom 2" of the mesh between the notches up into a slightly curved 90 degree angle to form a lip as shown. 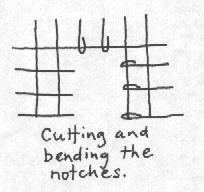 Then bend the walls at the center of each notch to form a corner. 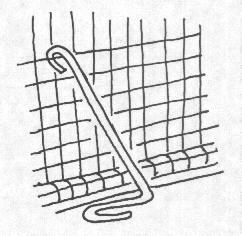 Fasten the ends of the walls together with the cage clips to form the fourth corner. Step 5: Set the walls on top of the cement mixing tray. Mold the cage lip to fit the lip of the tray. Make the 2 fasteners to join the cage to the tray by bending the heavy wire as shown. The size of the fastener is critical, so be sure to measure carefully. Hook the small loop on the wire mesh. The big loop should slip tightly underneath the lip of the tray. If it doesn’t fit securely, you need to adjust the fastener, or make another one that will. Once it fits securely, bend the small loop closed to attach it to the cage. Step 6: To make the top, unroll the last roll of mesh. Cut a piece 36" long. Leave the “tails” on the remaining smaller piece which will be the door, or if you are going to use different mesh for the door, you can use it for a shelf. Before you put the top on, you should put in any shelves. I recommend using an uncut edge of the mesh for the front of the shelf. In the drawing of the finished cage, you'll see the front edge of the shelf is bent down, however, on my cage I ended up bending it up instead to make a lip to keep my rats from pushing food dishes off their shelf. Bending the front edge of the shelf up ½" strengthens it. If you want the shelf to be permanent, you can attach it with cage clips. If you might want to take it out later, you can use the “tails” to fasten it to the cage. 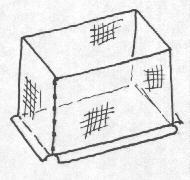 Put the shelf in place with the “tails” poking through the mesh and bend them down on the outside of the cage. Step 8: Decide how big you want the door. We made the opening for ours 11" wide and 12" tall and this seems to be big enough (a Senior Wodent Wheel will fit through but not a Wobust). If you’ve put in a shelf, you may have move the door over slightly away from the shelf. When cutting the opening for the door, cut it ½" smaller on each side making sure to leave the “tails” of the wire. Then bend these over to make a nice smooth finish to the door as shown. Cut the door itself 1 ½" bigger than the opening on 3 sides for overlap. Again, leave the tails on those 3 sides and bend them over to make a nice edge. Attach the side of the door without the “tails” bent over to the cage with cage clips as hinges. To make the door fasteners put one end of the spring onto one loop of the S-hook and with the pliers, bend the loop closed. This will take a fair amount of strength. Attach the other end of the spring to the cage.